Our May Chang bar is guaranteed to energize your day and put you in a sunny mood. May Chang smells intensely lemony yet the scent is sweeter and fruitier. The bar is smooth and creamy with a golden yellow color from turmeric. What’s may chang? It’s the common name of Litsea cubeba, a member of the Laurel family growing in East Asia. Its leaves are loaded with citral, which also imparts the scent to lemon verbena. Lemon verbena essential oil, used in perfumes, would be too expensive to use in our soap. 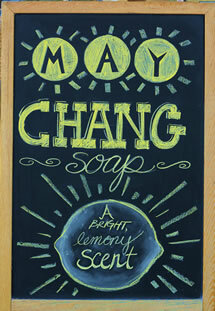 Besides, honestly, we think may chang smells brighter and fresher. The first-rate cleansing benefits of this bar work well for face and body. In addition, it is said to relieve oily skin and acne and provide a calming effect on the nervous system. Love May Chang? 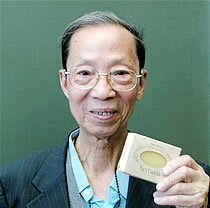 Try the Lemon May Chang Luffa Soap.